I saw this recipe last year. Last year, however, I was in no position to be going off plan and eating on my own in anyway. I was so determined to lose the weight and nothing was going to get in my way. BUT… now, I’m at a point where JC is actually ENCOURAGING me to start transitioning from JC food to real food. So, I pulled it out of the archives! Do you know Hungry Girl?? I think she’s amazing. She’s all about low-cal treats and helping the world eat what they want while losing weight. She has a fabulous website and is even on the Food Network these days! If you haven’t had the pleasure, I definitely recommend you check out her site. 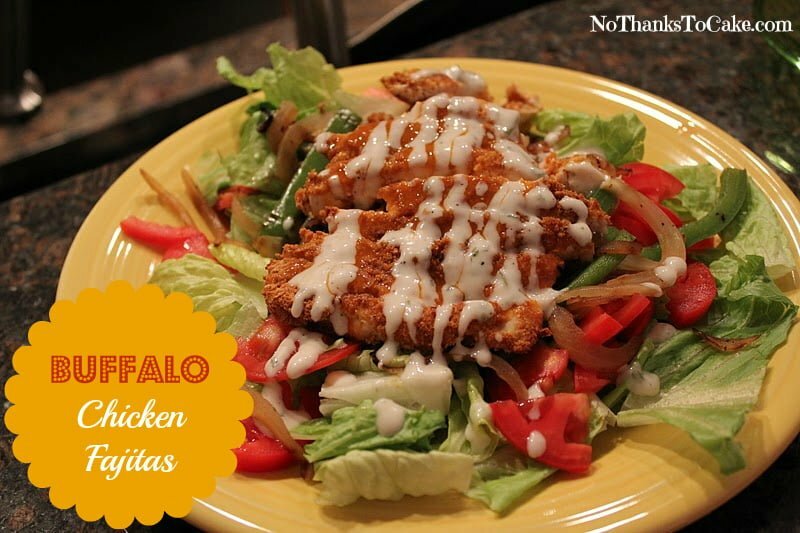 This specific recipe is a “Swap” for Chili’s Buffalo Chicken Fajitas and a MUCH healthier option for us “losers” to choose. 1. Preheat oven to 375 degrees. Spray a baking pan with nonstick spray and set aside. 2. Place cereal in a sealable plastic bag; remove air, and seal. 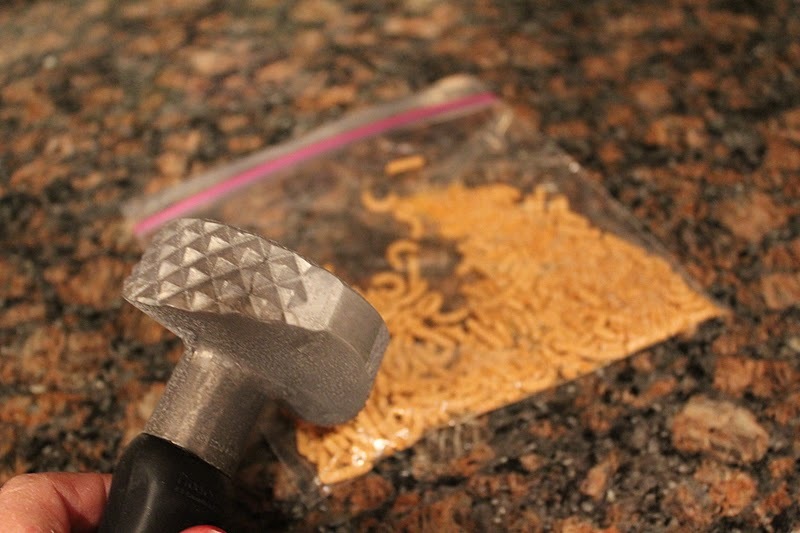 Using a meat mallet (or other heavy utensil), crush cereal to a breadcrumb-like consistency through the bag. Add garlic powder and onion powder. Seal and shake to mix. Transfer to a plate and set aside. 3. 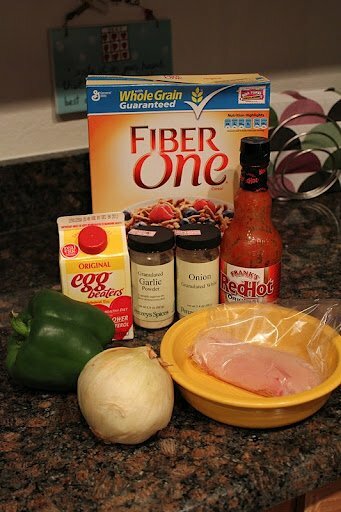 Place chicken on another plate and top with egg substitute. 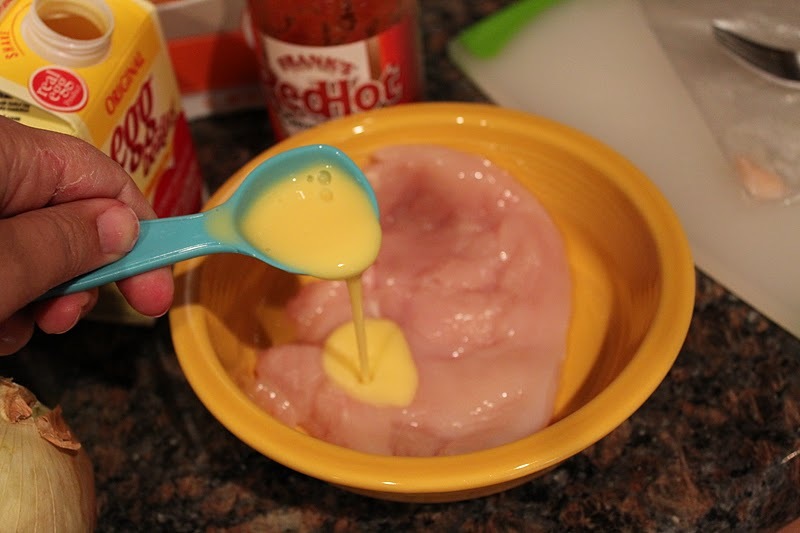 Flip chicken to coat both sides. 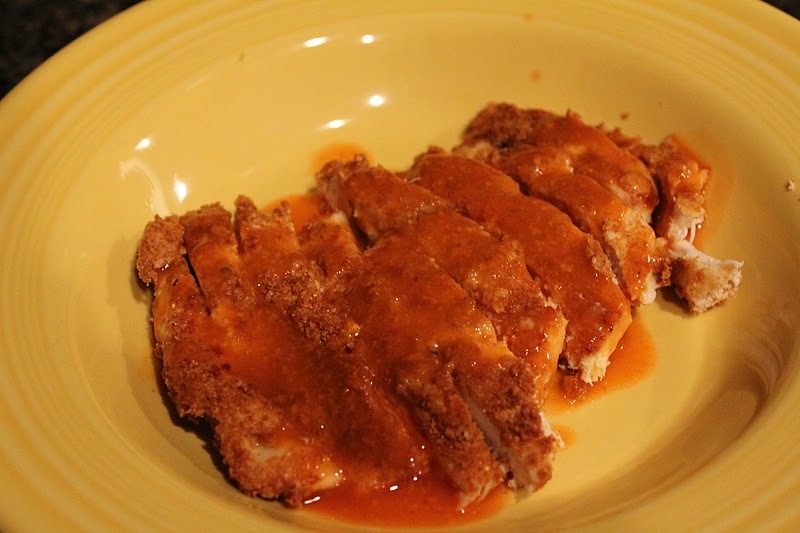 Gently shake chicken to remove excess egg substitute, and transfer to the plate of crumbs. 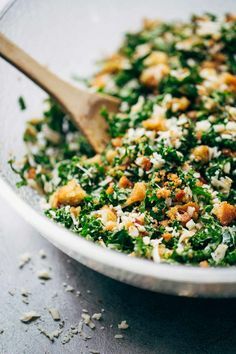 Flip to coat both sides with crumbs. 4. 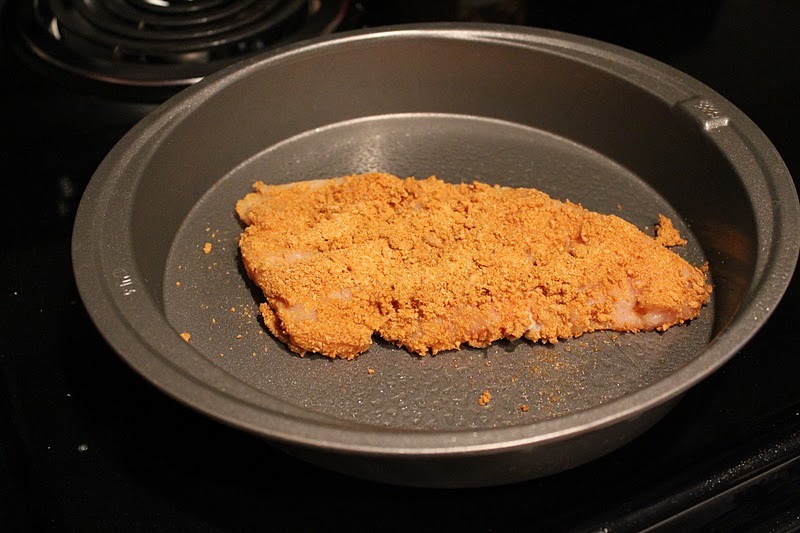 Place chicken in the baking pan and bake in the oven until crispy and cooked through, about 30 minutes, carefully flipping about halfway through bake time. Set aside. 5. Meanwhile, bring a skillet sprayed with nonstick spray to medium-high heat on the stove. 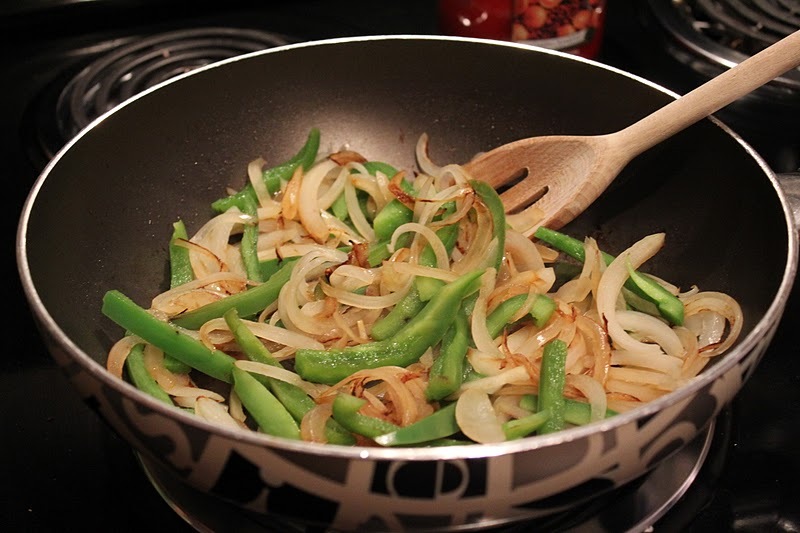 Add bell pepper and onion and, stirring occasionally, cook until softened, 6 – 8 minutes. Transfer veggies to a clean plate and set aside. 6. 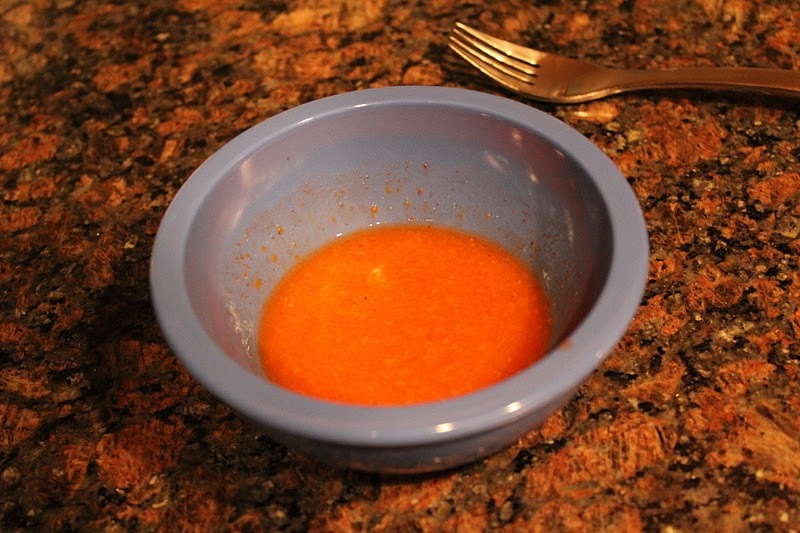 Combine hot sauce with 1 tbsp. water in a bowl, and mix well. 7. Once chicken is cool enough to handle, slice and then carefully coat both sides of cooked chicken with sauce mixture. Place over the plated veggies. Top with any remaining sauce mixture. 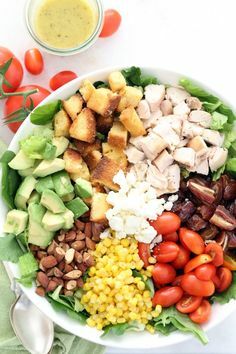 I served mine over a small bed of romaine with some sliced roma tomatoes. The original HG recipe suggests topping with bacon and blue cheese. 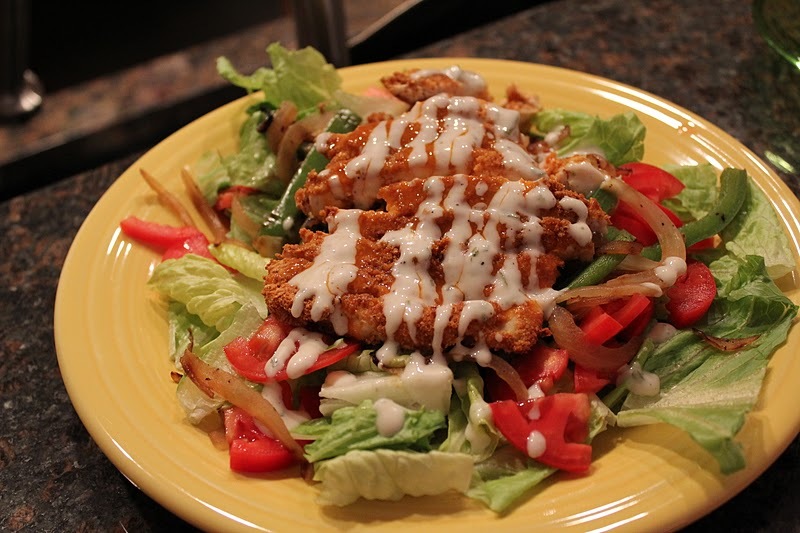 Instead of adding the bacon and blue cheese, I drizzled the meat with light ranch dressing. Choose the garnish you like most!